MACD is an acronym of the much longer phrase “Moving Average Convergence Divergence”. Some traders may pronounce this as Mack-Dee, instead of saying each letter individually Em-Ay-See-Dee. 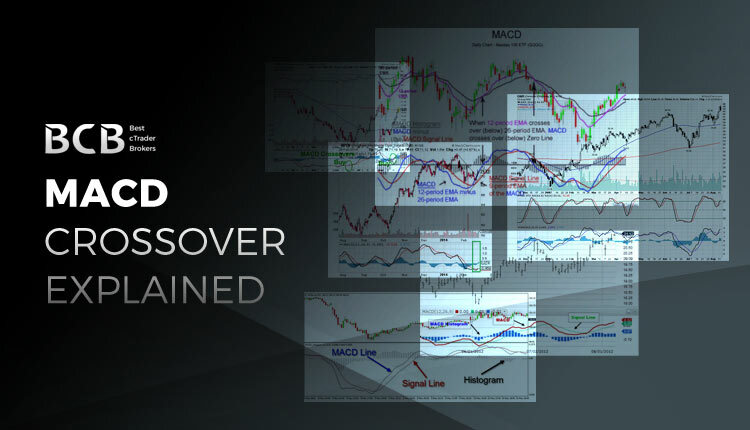 MACD Crossover is a popular indicator used when trading forex, stocks and more. It’s used as a trend following indicator and a momentum oscillator. MACD shows the convergence and divergence of two Exponential Moving Averages (EMA) hence the name “Moving Average Convergence Divergence”. The MACD indicator is made up of three components. The indicator plots 2 lines and 1 histogram. Use the next image for references. The first is the MACD Line, this is the solid blue line. It is the difference of two Exponential Moving Averages. One of the EMAs being a Short Cycle, typically 12 periods and the other being a Long Cycle, typically being 26 periods. The second is the MACD Signal Line, this is the red dashed line. The Signal Line is usually a 9-period exponential moving average of the MACD Line. The third is a histogram which is the green pattern. It shows the difference between the MACD line and the Signal line. The MACD Line fluctuates above and below 0, which is also known as the MACD Baseline. This happens as the distance between the Long and Short EMA increases and decreases. When the Short EMA is above the Long EMA the MACD Line is above the baseline and when the Long EMA is below the Short EMA the MACD Line is below the baseline. The MACD histogram is the difference between the MACD Line and the EMA Signal Line. Like all technical analysis indicators, they can be read in different ways and should always be paired with others to verify any signal. The MACD presents signals in various forms. These are with a crossover, divergence and indication of trend strength. The most common MACD signal is when there is a crossover between the MACD Line and the Signal Line. This will also appear as the histogram crosses the baseline. This signals a possible change in direction. When the MACD Line crosses above the Signal Line this presents a bullish signal and vice versa, when the MACD Line crosses below the Signal Line this presents a bearish market. A more advanced signal is divergence. Divergence occurs when the market is trending and is making new highs or lows, but the MACD histogram fails to make new lows or highs. This is a strong indication that a trend is exhausting. When there are two failed highs or lows on the candlestick price chart that do not correspond with the MACD indicator. The MACD can be used to indicate the strength of a trend. The bigger the difference of the Moving Averages the stronger the trend. This means an upwards slope of the MACD Line shows that the moving averages are drawing further apart and thus the trend is strengthening. It’s also important how much higher or lower the MACD Line is above the baseline. The further the line is from zero level the stronger the trend. A very big distance from zero level could indicate an oversold or overbought market. In cTrader, there are two versions of MACD available. In this post, we have covered the MACD Crossover indicator. cTrader features an additional MACD indicator called “MACD Histogram”. This indicator only plots the MACD Line as a histogram and the Signal Line. I.e. there are only two of the three elements from the list above. When setting up the MACD Crossover in cTrader there are different parameters which you can control. There is the “Long Cycle” which is the number of periods of the slow EMA. The “Short Cycle:” which is the number of periods of the fast EMA. And the Signal Periods which is the number of periods of the Signal Line’s EMA. The MACD Crossover was created by Gerald Appel in the late 1970s and it became known to traders in 1979. 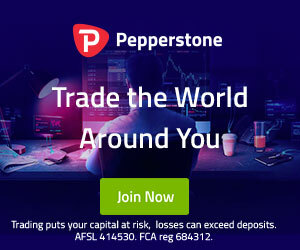 Appel is a professional money manager and investment advisor. Not only does he get heaps of respect from being the creator of one of the core indicators in almost every trader’s toolbox, but he has also written or co-authored over fifteen books to date. Even with this much credibility under his belt, he has one more secret weapon when it comes to reassuring investors, he is a qualified psychotherapist. This allows him to also address the personal and emotional concerns of his clients and not only their financial needs.